According to the Chinese records, Chenla at its peak was a large and powerful kingdom. It was also immensely wealthy. 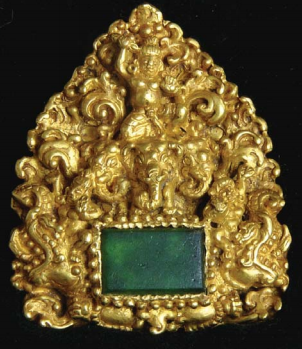 During the reign of Isanavarman, which corresponds roughly to the years 619-636, Chenla diplomatic missions presented many rich and luxurious presents to the Emperor of China. By some point in the seventh century, Funan had disappeared altogether from the world of Asian diplomacy, and it was reported by the Chinese that the upstart empire of Chenla, invading from the north, had ‘conquered’ Funan. It was during this period that Chenla took over the ancient Funanese city of Angkor Borei- either through war or, as others argue, more peaceful methods of absorption- and a large and impressive brick temple in the Chenla style was built atop Phnom Da, complete with a monumental sculpture of Vishnu. By this point their kingdom stretched from what is now the Isaan region of Thailand all the way to the Mekong Delta, in what is today’s Vietnam. Evidently Isanavarman’s Chenla was a far larger and more powerful entity than Funan had ever been. The prince makes his residence in the city of I-she-na (Isanapura), which contains more than twenty thousand families. In the middle of the city is a great hall where the king gives audience and holds court. The kingdom includes thirty other cities, each populated by several thousands of families, and each ruled by a governor; the titles of state officials are the same as in Lin-yi. Now even allowing for a degree of hyperbole in the headcount, Isanapura would have been a city of some fifty-thousand people or more, meaning it dwarfed the cities of Europe of the day, then plunged into the Dark Ages. And this was just the centre of a large kingdom containing many subsidiary centres. We by no means know the location of all these ‘thirty other cities’, but we can presume that one of them would have been Angkor Borei, another would have been the ancient centre of Prey Veng, a third would have been the riverside settlement of Hanchei, of which a single Chenla-era temple remains on a hill above the Mekong, near the modern city of Kampong Cham, and a very important final inclusion would have the sacred city at the base of Mount Phu in what is now Southern Laos. But of all these vanishes centres, none would have matched the grandeur of Isanapura, which had served as the capital of his uncle , Bhavavaraman and then his father Mahendravarman, but which was brought to its fullest development during the two-decade reign of Isanavarman. Every three days the king proceeds solemnly to the audience hall and sits on a couch made of five kinds of aromatic wood and decorated with seven precious things. About the couch there rises a pavilion hung with magnificent fabrics; the columns are of veined wood and the walls of ivory strewn with flowers of gold. Together this couch and this pavilion form a sort of little palace, at the back of which is suspended, as in Chih-tu, a disk with gold rays in the form of flames. A golden incense-burner, held by two men, is placed in front. The king wears a dawn-red cloth of cotton that falls to his feet. He covers his head with a cap laden with gold and precious stones, with pendants of pearls. On his feet are leather sandals; in his ears, pendants of gold. His robe is always made of a very fine white fabric called pe-ti. When he appears bareheaded, one does not see precious stones in his hair. This description of the prince is, of course, King Isanavarman, the king who the Chinese credited with conquering Funan. His namesake city was founded early in the early seventh century by his uncle Bhavavarman, several kilometres away from the flood-prone Stung Sen River, which ran down from the Chenla kings’ spiritual homeland in the Dangkrek Mountains, past the site of Sambor Prei Kuk (home of ancient Isanapura) and finally entering Tonle Sap, the vast lake at the centre of modern Cambodia. It may have been the first temple-city in all South-East Asia, with the kings of Chenla- only a generation or two removed from the Dangrek Mountain chiefs who were their ancestors- installed in the fabulous city as the supreme ruler of their worldly realm. The depiction of the splendour and luxury in which the king lived shows that Chenla was a highly striated society in which Isanavarman stood as a highly revered and mysterious figure at the top of an enormous hierachy. By this point the more egalitarian world of the farming village had been left far behind. In his grandeur and fabulous wealth, the king of Chenla must have far surpassed the prestige and glory of his recent ancestors, who ruled small, mountain chieftancies: he was already well on the way to becoming something like the Hindu deva-raja (God kings) who were to rule over Angkor. And befitting a semi-diety of his magnificence, the furnishings, clothing and rituals of his palace were all imbued with immense, almost mystical, significance. In reading the description of Isanavarman’s court, we see the South-East Asian kingdom coming into its own. We see in it all the religious symbolism and luxurious trappings that today surrounds the Kings of Thailand and, on a somewhat more modest scale, Cambodia. Like today’s King Bhumibol Adulyadej of Thailand, who is viewed by many Thais with a devotion and reverence that borders on the religious, Isanavarman’s presence was invested with supernatural significance. Funerals are conducted in this way: the children of the deceased go seven days without eating, shave their heads as a sign of mourning and utter loud cries. The relatives assemble with monks and nuns of Buddha or the Hindu Priests, who attend the deceased by chanting and playing various musical instruments. These corpses are burned on a pyre made of every kind of aromatic wood; the ashes are collected in a gold or silver urn to be thrown into deep water. The poor use earthenware urn, painted in different colors. There are also those who content to abandon the body in the mountains, leaving the job of devouring it to the wild beats. As we set off into the jungle-fringed site of Sambor Prei Kuk, already thronged by children wanting to sell us traditional cloths and various trinkets, I marvelled to think that Khmer people had occupied this site for fourteen centuries, making pottery, playing instruments, singing and chanting, and mouring the passing generations. The city was already three hundred years old when Angkor civilization began to rise and was almost six-hundred years old when Angkor Wat was completed. Sixty generations had come and gone since the city was founded and though Sambor Prei Kuk was now just a small village in the midst of jungle-clad ruins, Khmer daily life still went on there, following its own unique rhythms. From Phnom Bokor we rode back down the mountain, with panoramic views of the coastal plain and the Gulf of Siam appearing at each bend of the road. A couple of times we pulled over and tried to get our bearings by the major landforms and waterways: that over there was the Kâmpôt River, that was the centre of town and that down there was the limestone spine of the Kep Peninsula. Thinking of Mount Jerai in Malaysia, which ancient Tamil seafarers had once navigated by, I concluded that Phnom Bokor too would have been visible far out to sea and that visitors to ancient Cambodia must once have made their way towards this cloudy mountain, knowing it as the shoreline of the kingdom of the Khmers. Once we were back downhill, we stopped off in town for lunch at one of the restaurants along the waterfront. The proprietor was an Australian retiree who had set up a bar with some of his superannuation founds. We were the only customers but he said that the kitchen was open and promised that we’d have our meals within half an hour. In the meantime Cam and I took turns playing pool with Donal. Presuming, correctly, that Cameron and I were gay and incorrectly that Donal was one of our boyfriends- many Western men in South-East Asia have much younger partners- he produced a photo album which included many photos with his Cambodian boyfriend, who appeared to be in his twenties, and also with the young man’s extended family. Judging by appearances, he seemed to have been accepted as one of their own. He told us that he loved Cambodia and especially Kampot, which he described as a wonderfully peaceful place to live, and hoped that the costs of running a bar and restaurant here wouldn’t bankrupt him in his old age. I recognized in the note of anxiety which appeared at this moment the underlying insecurity of the long-term expat in South-East Asia. While they are often comparatively wealthy and are afforded a high degree of respect within their adoptive communities, they are not citizens and there is much they do not understand: they often live in a state of material comfort and legal and cultural uncertainty. By the time we finished lunch, it was already three o’clock and the day seemed to be slipping away from us. We had decided over dinner the night before to head on to Sihanoukville the following day and head back to Phnom Penh from there; the road between the capital and the city’s main port was said to be one of the best in the country. This meant that we had to get a move on if we were to catch a glimpse of one of the Cave Temples of Kâmpôt before sunset. After topping up the bikes at the service station, we asked again for directions and then set off along the road to Kep. We had been told to continue about eight kilometres out of town until we saw a large Cham mosque on the left hand side of the road. Sitting behind Donal I tried to interest him in the fact that not only were the Cham Muslims like himself but that they were of Malay stock and their language was from the Aceh-Chamic subgroup of Malay languages, whose speakers were oddly split between Sumatra and Indochina. This proved to be too much information for Donal, who was enjoying the simple pleasures of driving a motorbike and didn’t appear to be paying me any attention. So I gave up the history lesson and kept an eye out for the mosque myself. Just before we reached it, I saw a woman walking down the road with her husband, her hair concealed beneath a jilbab, the Muslim head-dress. Her husband was wearing a sarong a long-sleeved shirt. This seemed a scene right out of rural Jambi or Kelantan, and then the mosque appeared beneath a grove of coconut trees, completing the impression that we had returned to the Malay world. “That’s it, that’s the mosque, Donal”, I said in Indonesian and he turned off the main road onto a dusty track which headed off through the fields. Passing houses we noticed more people in Muslim dress and I realized that there must be have been a whole Cham kampong around these parts. Past these group of houses we continued for a couple of kilometres until we arrived at a limestone outcrop, which seemed to be a likely location for a cave temple. There was also a shed on one side of the road and a few youth hanging about, which seemed to indicate that this might be the entrance place to a tourist site. A man came forward to introduce himself as the ticket-seller and we forked out one dollar apiece for the right to visit the cave. It was around this point that we realized that we had come to the wrong cave temple! The one we had been looking for was Phnom Chhnork, which was promoted in all the tourist literature on Kâmpôt. Like this one, it was set a couple of kilometres off the main road through the rice paddies and contained within a limestone outcrop, but this, we were assured, was not Phnom Chhnork. This one was known as Kbal Romeas Archaeological Site (according to the metallic sign mounted just ahead) and it had yet to find its way into any of the guidebooks. Still we figured that if tickets were being sold and there was a sign in English, there must have been something to see here. It turned out, we learned much later, that there were several cave temples in the vicinity of Kâmpôt, of which Phnom Chhnork was merely the most famous and best-preserved. The main distinction of the Kbal Romeas site, apparently, was that some precious gold jewelry, including a splendid gold girdle, had been excavated here before the Khmer Rogue takeover, only to be looted during the chaos of the 1970s. It was thought to date to the Funan or possibly the Chenla period, demonstrating the absorption of Indian art styles by the earliest Khmer kingdoms. But we knew nothing about the gold at this point; instead, our guides were pointing out the quarry, which had cut away a large chunk of the hill. Apparently limestone was being quarried all around the district, chiseling away at the very hills which contained the caves and their ancient temples. We were once again left with a very distinct impression that the nation’s heritage was in a very precarious state, threatened by the desperate poverty of the people who lived there. Apart from sharing these thoughts with Cameron, we went about introducing ourselves to the group of four teenagers who had appointed themselves as our guides. They said that the lived thereabouts, so I asked if they were Cham, but they seemed rather offended by the suggestion: the Cham lived in the next village; they were all Khmer. They led us in through the narrow cave mouth, pointing the way with battery-powered torches. They were obviously prepared to guide visitors like us as they had memorized all the main features of the cave, both natural and cultural, and had learned a few simple English phrases to accompany each ‘sight’. They gestured at the stalagmites and stalactites, the most glittering of the crystal formations, and the mineral formations which resembled human or animal forms. Those with better English repeated the key phrases, while the others shone the torches on the objects being described. There were numerous small passages and in a couple of places there were fissures in the roof of the caverns, allowing daylight to penetrate. In one of this caverns, the light shone on a few tea bushes which had managed to survive in one well-lit corner of the cave. These were attributed to the activities of early inhabitants of the caves. There were also small bats on parts of the ceiling, which began to fly about if the torch was shone on them. Really the most memorable things about the excursion was the guides themselves. They were clearly very proud to be showing foreign tourists around the cave and were perfectly kind and courteous. This was the kind of welcome which is only possible in a small village which has seen very few visitors to date; mass tourism and the resultant commercialization of relations soon leaves both sides a lot more jaded and weary. But apart from the kindness of the guides, there was a small cave temple to report on. Unfortunately, unlikely the better known example at Phnom Chhnork, which had apparently survived in an excellent state of preservation, this was one was little more than a pile of rubble. All that remained of the cave temple at Kbal Romeas was the base of the temple and a section of staircase leading up to a higher level of the shrine. The rest of what had once been an ancient brick shrine, some two or three metres tall, had been reduced to a pile of rubble. According to our guide, this place had been a sacred place since the time of Funan, fifteen or sixteen centuries before, and Buddhist monks had come here to pray and meditate. 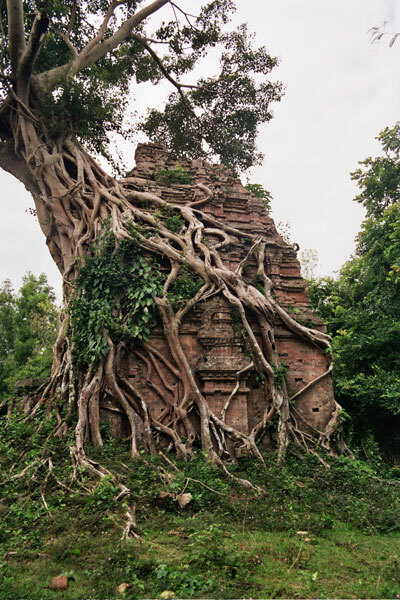 But after the Khmer Rouge takeover of Cambodia, they had come here as part of their war against religion and forced the locals to drop a large boulder through the hole in the roof directly onto the temple. The destruction we saw today was the result. Again we were confronted with the wanton destructiveness of the Khmer Rouge against their own people and heritage. Being Buddhists, the Khmer guides seemed just as aghast as us and explained that there had been many killings in all of their families. After we left the cave, we returned to our bikes and gave a tip to each of the guides, which they seemed very happy with. This seemed to us the best kind of tourism in that the benefits of directly flowed to people from the local area, giving them a reason to preserve the cultural remains. It was also just a pleasant interaction on a human level, with everyone smiling widely at the end of the visit. Donal finished it all by making his obligatory comment on how similar Khmer (or ‘Khmai’) people were to Indonesians, which the guides all agreed with good-humouredly. I asked about Phnom Chhnork, sorry to have missed an intact cave temple, and they said it would be closed now- it was already getting dark- but we could try the following day. It was just a few kilometres away they said: not a long ride. As we headed back into town, I wondered about these cave temples of Kâmpôt. After visiting Phnom Da and Angkor Borei, following the views of Professor Dowling, I had accepted that the statuary and temples from Phnom Da dated to the seventh century, not the sixth, meaning that the oldest Hindu temples and statues from Cambodia dating from the period when Chenla was in its ascendancy and Funan was already in the process of submission to the new kingdom. This left open the possibility that rather than being culturally similar, Funan and Chenla were markedly different, with the earlier kingdom being much less endowed with ‘Indian’ cultural attributes. However, the cave temples of Kâmpôt were clearly Hindu shrines and they were usually said to be the work of Funan. I wondered how firm the dates were in this part of Cambodia. Could these cave temples really have been the work of Chenla too? Or were these early simple cave-temples really the product of Funan, after all, indicating that Hinduism had penetrated this region earlier than the floodplains of Takeo? Was this region even controlled from Angkor Borei at all? Perhaps, I speculated, it had been allied only loosely, if at all, to the cities of the Mekong Delta and these cave temples had marked a separate chapter in the history of Hindusim in Cambodia? Our trip here had raised many unanswered questions about these elusive early kingdoms.